A new sensor developed by ETH Zürich researchers makes it possible to measure when the body starts burning fat with a convenient breathalyser. This way, blood tests to check out intoxication can be replaced with just blowing into a tube, instead of this being just the first stage. The cost effective technology can also be used for testing the condition of athletes and for people who want to lose that extra bit of weight. Experts advise anyone looking to shed extra kilos to eat less and exercise more. One way is with endurance training, during which the body burns not only carbohydrates such as sugar, but also fat. When exactly the body begins burning fat can be determined by analysing, for example, biomarkers in the blood or urine. Scientists at ETH Zurich and the University Hospital Zurich have developed a method for the highly convenient, real-time monitoring of lipolysis by testing a person’s exhalations during exercise. “When burning fat, the body produces by-products that find their way into the blood,” says Andreas Güntner, a postdoc in the group of ETH Professor Sotiris Pratsinis. In the pulmonary alveoli, these molecules – especially the volatile ones – enter the air exhaled by the person. The most volatile of these lipid metabolites is acetone. Güntner and his colleagues have developed a small gas sensor that measures the presence of this substance. The sensor is much more sensitive than previous sensors: it can detect a single acetone molecule in hundred million molecules. It also measures acetone exclusively, so the more than 800 other known volatile components in exhalations do not affect the measurement. 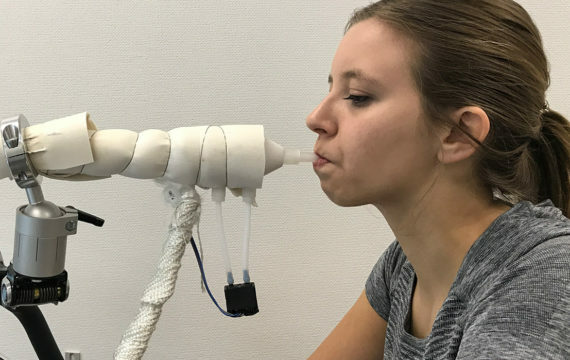 In collaboration with pulmonary specialists at the University Hospital Zurich led by Malcolm Kohler, Professor and Director of the Department of Pulmonology, the researchers tested the functioning of the sensor in volunteers while they exercised. Researchers asked the test subjects to blow into a tube that was connected to the acetone sensor at regular intervals. “We were able to show how the acetone concentration in the exhalations varies greatly from person to person,” explains Güntner. Scientific opinion used to hold that athletes only begin burning fat after a certain period of physical exertion and on reaching a certain heart rate, but this generalistic view is now outdated. The measurements taken by the researchers in Zurich showed that lipolysis in some test subjects did, in fact, only start towards the end of the one-and-a-half-hour training session. In the other volunteers, the measurements showed that their bodies began burning fat much sooner. Control measurements showed that the new measurement method correlated well with the concentration of the biomarker beta-hydroxybutyrate in the blood of the test subjects. This blood analysis is one of today’s standard methods for monitoring lipolysis. The sensor developed by the scientists uses a chip coated with a porous film of special semiconducting nanoparticles. The particles are tungsten trioxide that the researchers have implanted with single atoms of silicon. Development began seven years ago when ETH Professor Pratsinis and his colleagues discovered that tungsten trioxide nanoparticles interact with acetone if the atoms of the nanoparticles are arranged in a certain crystalline structure. The interaction reduces the electrical resistance of the chip coated with the nanoparticles, and this phenomenon can then be measured. Originally, the idea was to use the chip to diagnose diabetes, because the exhaled breath of patients with untreated type 1 diabetes contains high concentrations of acetone. Since then, however, the scientists have shown that the sensor is in fact sensitive enough to detect the very low acetone concentrations in a person’s exhalations during exercise. The chip used in this study is the size of a 1-cent euro coin, but the researchers are working to refine the measurement technology so that it will be possible with much smaller chips. The goal is to offer the chip in a manageably sized device. “This would allow athletes and people who want to lose weight to check for themselves when their bodies begin to burn fat so that they can optimise their training regimen,” says Güntner. Highly sensitive acetone measurements were already possible with instruments like mass spectrometers – large laboratory devices that cost several hundred thousand Swiss francs. The researchers are using these instruments in the current study to verify their measurements. Portable acetone breath tests also exist, but they can only be used once and take several minutes before they show the results. The scientists are now planning to continue developing their measurement method so that they can eventually market it. They already have a prototype of the instrument. The scientists are also working on developing gas sensors for other medically relevant molecules in exhalations, including ammonia to test kidney function, isoprene to test cholesterol metabolism and various aldehydes for the early detection of lung cancer.